This is correct. Boston was part of the first marathon boom brought on by the invention of the modern Olympiad, and is now well into its second century. For comparison, marathons of the second marathon boom (e.g., NYC) are now considered relatively old (at least when compared to the ubiquitous “Rock and Roll” marathons of the 21st century), and they’ve only been around since the ‘70s. Eh, not really. While there are certainly a number of very good competitive amateur runners running this morning, the times of the top 1000 runners at Boston don’t look much different from the times of the top 1000 at Chicago or NYC. Good runners will always show up to the big races. What Boston does attract, however, are the men and women aged 35 to 55 who qualified for Boston by a minute or two. Those people love to run Boston. They’re not exceptionally fast or talented (think 42-year old women running 3:44 marathons, and 50-year old guys running 3:29s), but they make for a relatively solid middle of the pack. And let’s not even get started on the 25% of the field who didn’t even qualify (such as charity runners and friends of sponsors). This is probably the biggest fallacy. Yes, Boston has some big hills towards the end, and you better be ready to run those hills if you want to run your best. But let’s back up. Boston is a net downhill course. In other words, the finish line is several hundred feet lower than the starting line. So while there may be some intervening challenges, you’re still getting a course that should theoretically help your time. Also, because it is a point-to-point course (as opposed to a loop like Chicago, where you finish roughly where you started), there is always a theoretical possibility of a helping tailwind. The next time someone tells you how hard Boston is, understand this: because Boston uses a point-to-point, net downhill course, their times are not eligible for the World Record (or American Record, for that matter). Of course, all of these things were true for the last 100 years, but you could never get a loyal Bostonphile to admit that their race was, net-net, not as tough as NYC. Until 2011, that is. In 2011, there was perfect weather and a helping tailwind, and the elite runners ran times that will not be run on a flat loop course for many years to come. So while it's a demanding course, so are most courses that consist of 26.22 miles of running. 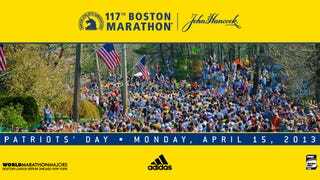 Hell, Boston isn’t even the biggest marathon this week. For a lot of reasons (actually, one reason: money), this coming weekend’s London Marathon will make Boston look like the JV race. The winner of today’s race would likely be a huge underdog to the 8th place finisher in London. That race is just loaded. Because Boston knows that they can’t assemble a field that even resembles London, they’ve wisely focused on attracting the top American athletes. This has worked pretty well in years past, and it’s made for some exciting races if, like me, you’re the kind of jingoistic fan who is ready to see an American win a major marathon even if it's a major marathon that has intentionally been watered down so that an American can have a chance to win a major marathon. This year, they went 1-for-2 among the genders. On the men’s side, they invited all three US Olympians, and all three of them have since dropped out due to injury. So unless you’re really excited to see if Brian Hartmann can finish in the top ten (and who isn't? ), this isn’t a race for the average American sports fan. Personally, I’d love to see Desisa, a young Ethiopian, just run away with it – we could use a new star. The women’s side is a different story. Not only do they have the two most attractive female American runners in the field (Flanagan and Goucher), they both appear to be in good shape – especially Flanagan, whose recent 10000m at the Stanford track meet would indicate that she’s a legitimate contender for this race. Goucher is less fit, but she’s a good racer, and could seriously contend for a top-3 finish if she runs her own race (as opposed to going out with the lead pack, which will leave a trail of strugglers for her to pass during the race). Of course, there are still a couple handfuls of women in this race with faster PRs than both of the Americans, but the marathon is a crazy race, and they're at least close enough to make the women's side worth watching. So in an hour or two, I’ll start the LIVEBLOG. If you have any questions about this, leave them here or in the LIVEBLOG comments.